The Fluke 321 and 322 are designed to verify the presence of load current, AC voltage and continuity of circuits, switches, fuses and contacts. 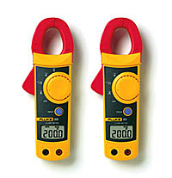 These small and rugged clamp meters are ideally suited for current measurements up to 400 A in tight cable compartments. The Fluke 322 also offers DC voltage measurements and has a higher resolution for loads below 40 A.